Gout - Definition, Diagnosis and Treatment - Pain.dieutridau.com - All for Pain Relief ! Gout is induced by inflammation from mono- sodium urate (MSU) crystal deposition. The primary risk factor for MSU deposition is hyperuricemia. Hyperuricemia and gout develop from excessive uric acid production, a decrease in the renal excretion of uric acid, or both. Primary hyperuricemia results from an inborn error of metabolism and may be attributed to several biochemical defects. 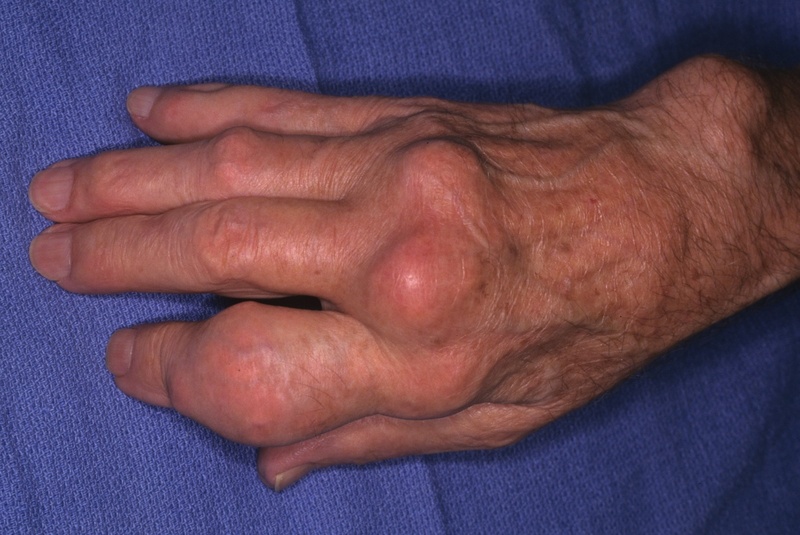 Secondary hyperuricemia may develop as a complication of acquired disorders (e.g., leukemia) or as a result of the use of certain drugs (e.g., diuretics). Consumption of alcohol, especially beer, increases the risk of gout, and fructose-rich beverage intake is associated with hyperuricemia. 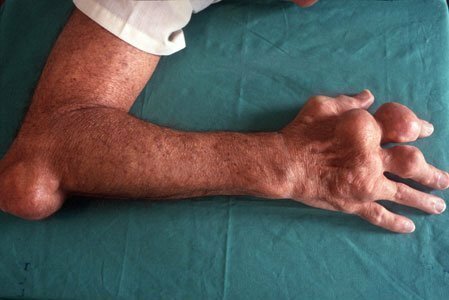 Section II describes the differential diagnosis of acute monoarticular and oligoarticular arthritis. Uricacid: All patients with gout are hyperuricemic at some time, but during an acute attack the serum uric acid may be normal or low. Low-dose colchicine (less toxic and as effective as traditional high-dose colchicine): 1.2 mg colchicine PO, followed by 0.6 mg PO 1 hr later. Lifestyle and dietary modification may be effective in highly motivated patients. Recommendations include reducing ingestion of red meat, kidney, liver, yeast extract, shellfish, and overall protein along with restricting alcohol intake. These recommendations should be attempted only in patients with modestly elevated uric acid, as dietary modification can only lower uric acid 1 mg%. Discontinuation of diuretic therapy may help. ALLOPURINOL: Allopurinol is very effective and safe when used properly. Correct dosing and patient compliance are essential elements in the prevention of erosive and tophaceous gout. Patients with renal insufficiency are at increased risk for allopurinol hypersensitivity, which manifests as fever, rash, and hepatitis occurring most commonly in the first 3 mo of therapy. The rash may progress to life-threatening toxic epidermal necrolysis if not recognized early. Traditionally, therapy with allopurinol is initiated several weeks after the acute attack has resolved. However, adding allopurinol at initial presentation may improve long-term compliance without reducing the efficacy of acute treatment. The initial dose should be low (≤100 mg/day depending on creatinine clearance) in patients with renal insufficiency and those with very high uric acid levels. High initial doses are associated with increased incidence of allopurinol hypersensitivity. The serum uric acid should be reevaluated after 4-6 wk of therapy, and the allopurinol dose adjusted to reduce the serum uric acid to less than 6 mg%. The most common therapeutic dosage of allopurinol is 300 mg/day, but dose may be increased by 50-100 mg every two to three weeks until the target serum uric acid level is achieved. There is evidence that increasing allopurinol doses in patients with renal insufficiency does not result in significant toxicity, but concurrent use with statins and colchicine is associated with a higher incidence of adverse effects. Some authors have reported using doses as high as 800 mg daily without excess toxicity. FEBUXOSTAT: Novel xanthine oxidase inhibitor that has been shown to be more potent than allopurinol 300 mg daily for reducing serum uric acid. The chemical structure of febuxostat is different from allopurinol, making cross-reactive allergy unlikely. The metabolism of febuxostat is primarily hepatic, which obviates the need for dose adjustments due to renal insufficiency. Some cases of hepatic toxicity have been reported, and it is recommended that liver function tests be monitored periodically. Febuxostat may help preserve renal function in patients with chronic kidney disease (CKD) but has not been tested in patients with severe renal failure. The primary indication for febuxostat is demonstrated allergy to allopurinol. The cost of febuxostat may be as much as 40 times that of allopurinol. PEGLOTICASE: Intravenous pegylated uricase was approved by the FDA in 2010 for treatment of severe refractory tophaceous gout. It is a pegylated recombinant mammalian uricase that rapidly degrades urate when given intra- venously. Use is limited by very high cost and significant toxicities including frequent gout flares and anaphylaxis. It is essential that patients, families, physicians, and other members of the health care team appreciate the importance of compliance with a daily allopurinol regimen if recurrent flares and progression to chronic arthritis and tophi are to be avoided. Allopurinol should be discontinued only for symptoms suggesting the hypersensitivity syndrome. It should be continued during flares, medical illnesses, and surgical procedures. More in this category: « What Is Fibromyalgia?